It wasn’t just one person who went missing, it was two people. Two very different people. They were there, and then they were gone, as if through a crack in the sky. After that, in a small town like Goodwood, where we had what Nan called ‘a high density of acquaintanceship’, everything stopped. Or at least it felt that way. The normal feeling of things stopped. Goodwood is a small town where everyone knows everything about everyone. It’s a place where it’s impossible to keep a secret. In 1992, when Jean Brown is seventeen, a terrible thing happens. Two terrible things. Rosie White, the coolest girl in town, vanishes overnight. One week later, Goodwood’s most popular resident, Bart McDonald, sets off on a fishing trip and never comes home. People die in Goodwood, of course, but never like this. They don’t just disappear. An interesting novel just on the edge of crime fiction. The reader is never sure whether a crime has taken place or not. I found it a read that you had to take slowly just so that you wouldn’t miss anything important. We see life in the small town of Goodwood in rural Victoria through the eyes of Jean Brown, in her final year of high school. Rosie White, a year older than Jean, is the first to disappear. Her mother goes to wake her one Sunday morning and her bed is empty and her window wide open. Rumours fly thick and fast and the town is divided in opinion on whether she has run away or whether she has been taken, and is even perhaps dead. The town residents largely regard the town as a safe haven, somewhere where crimes can’t occur, where young people can largely roam without fear of attack. In fact a number of the residents including Jean’s mother have returned to Goodwood after a time away. It is a small town where everybody knows everybody-else, and most “nasty” characters are identified and avoided. Jeanie doesn’t always understand what she has observed and she is distracted by the arrival of a new girl in town. When a second person disappears, it seems that something is seriously wrong. The town has turned into a place of danger. A lovely read, lots of humour, and still enough mystery to keep this crime fiction addict engaged. At school, the normal feeling of things had stopped and the unease had set in. The news of Rosie White was everywhere. It had travelled down the telephone lines and across dinner tables onto the pages of the Gather Region Advocate. It had taken up residence in the minds of students and teachers. It sat in the silence between sentences; in the things that people did not say. Goodwood had never been visited by such collective worry, and we were not familiar with the burden of the unknown. 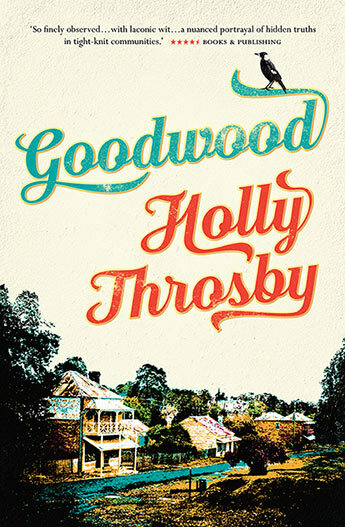 Given that Throsby is better known as an award winning singer-songwriter it ought not to be surprising that GOODWOOD has a poetic, often lyrical quality to its writing. The repetition of certain phrases or images for example serves a functional purpose in helping get across that there is a kind of rhythm to the town’s life, but it also reminded me of the way a chorus works in music. Overall the writing is quite simple I suppose but I would take issue with those who have labelled it simplistic. To me it felt like Throsby had chosen the right language and tone for this particular story. Language laden with artifice or dense phrases would have been all wrong. And the book is very, very readable. I devoured it in a couple of sittings. The dedicated fan of traditional crime fiction might be disappointed with GOODWOOD’s lack of procedural elements. Or even its lack of obvious crime given that whether or not anything criminal has taken place is unclear until the very end of the book. But what the book does have is a very careful unpicking of the big and small secrets that people keep. Even people in small towns where everyone knows everything about everyone. Throsby shows what superhuman effort can be needed to tell. Whether it was Jean screwing up the courage to tell the town’s policeman what she had found in the clearing, or permanently frightened Doe Murray who had to try 26 times before she summoned the will to leave her house and make her own report to the same policeman these portraits were outstandingly done. And there is suspense here, partly because the book isn’t following any well-worn path so the seasoned reader’s assumptions about who’s probably done what to whom are likely to be off-base. Having been underwhelmed recently by crime novels written by people famous in other fields, I didn’t really have huge expectations for GOODWOOD but I was pleasantly surprised by its thoughtful and authentic feel. Its depiction of the town’s mysteries being solved in large part through waiting for people’s secrets to come bubbling to the surface has a real ring of truth to it. As does the picture of the town as a whole – both before and after the disappearances. Top reading indeed. 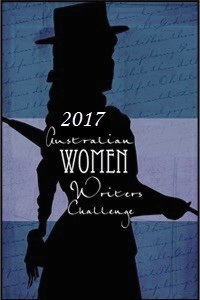 This is the 11th book I’ve read and reviewed for the 2017 Australian Women Writers Challenge. For more information about the challenge check out my challenge progress, sign up yourself or browse the Challenge’s database of reviews.